Tokyo, Japan, October 1, 2009 - Sony Corporation today announced the development of a single lens 3D camera technology capable of recording natural and smooth 3D images of even fast-moving subject matter such as sports, at 240fps (frames per second). This technology combines a newly developed optical system for single lens 3D camera which captures the left and right images simultaneously, together with existing high frame rate (HFR) recording technology to realize 240fps 3D filming. Sony will demonstrate a prototype model incorporating this technology at "CEATEC JAPAN 2009", to be held at Makuhari Messe convention center in Chiba City, Japan, from October 6th. Optical tests have shown that a frame rate 240fps represents the limit of human visual perception, and beyond that it becomes difficult to detect differences in terms of blur and "jerkiness" of moving images (where images that were continuous are now seen as a series of distinct snapshots). By developing a 240fps frame rate CMOS image sensor with properties close to the human eye, which is capable of capture natural images of even fast moving subject matter, Sony has succeeded in further enhancing the quality of 3D video images. 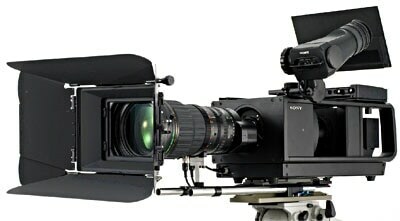 The combination of Sony's new single lens 3D system and its 240fps high frame rate technology has realized a single lens 3D camera system, based on universal properties of the human eye, which enables natural and smooth 3D images with no accommodation-vergence*1 conflict to be recorded. right eyes are within the range that human eyes can recognize as a blur. Prototype to be demonstrated at "CEATEC JAPAN 2009"
Within the growing 3D cinema industry, Sony has supported and driven the expansion of 3D by providing a wide variety of professional equipment for the shooting, production and screening of movies in 3D. The number of digital 3D screens is increasing rapidly, and is expected to reach 7,000 worldwide by the end of 2009*2 In addition to 3D movies, Sony's range of professional 3D products and technology is also driving the growth of 3D production and distribution across a range of entertainment industries, from theatre and music performances to sport and beyond. Furthermore, Sony is also aiming to continue to lead the way in delivering new 3D viewing experiences by bringing 3D to the home in 2010.